It’s almost kickoff time for America’s most-watched sporting event. On Sunday, February 4, as fans tune in for Super Bowl LII, lots of their game-day socializing that may include drinking. 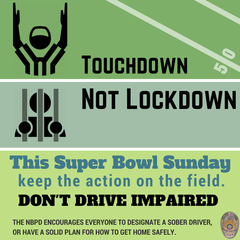 That’s why the Newport Beach Police Department joins the California Office of Traffic Safety (OTS) and Police Departments, Sheriff’s Departments, and the CHP statewide in sharing this reminder: If you plan on drinking on Super Bowl Sunday, designate a sober driver to get you home safely.